and a wild swan lowers to the earth, like using inner DAN practice. fly upward and lower downward quietly, noiselessly. The movement methods are entirely the same as for Extreme Emptiness Exercise, Blend the Elements with one breath (see Illustration 1-8). 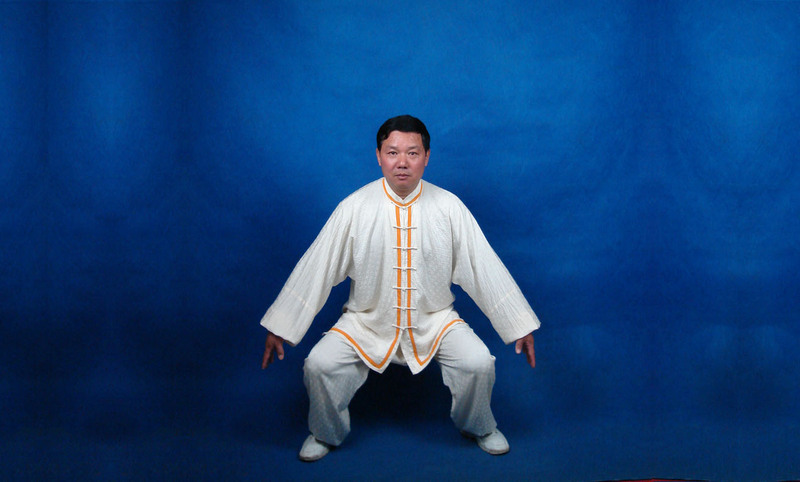 In practicing Swallow Flying Exercise, because rising and settling and circulating the BREATH are at the core, it is one way of using respiration as the master of cultivating the body inside and developing workmanship. When raising the arms upward to fly, it is essential to strive for: the head rising straight upward, the soles of the feet pressing on the earth, the body extending unanimously while simultaneously using the whole body, having the same appearance as though flying up into the sky. The centers of the feet YONG QUAN acupuncture points with the BAI HUI acupuncture point reflect each other. breathing in must be gradual, slow, careful, and long like pulling out a silk thread, namely long, well-distributed and so not broken. 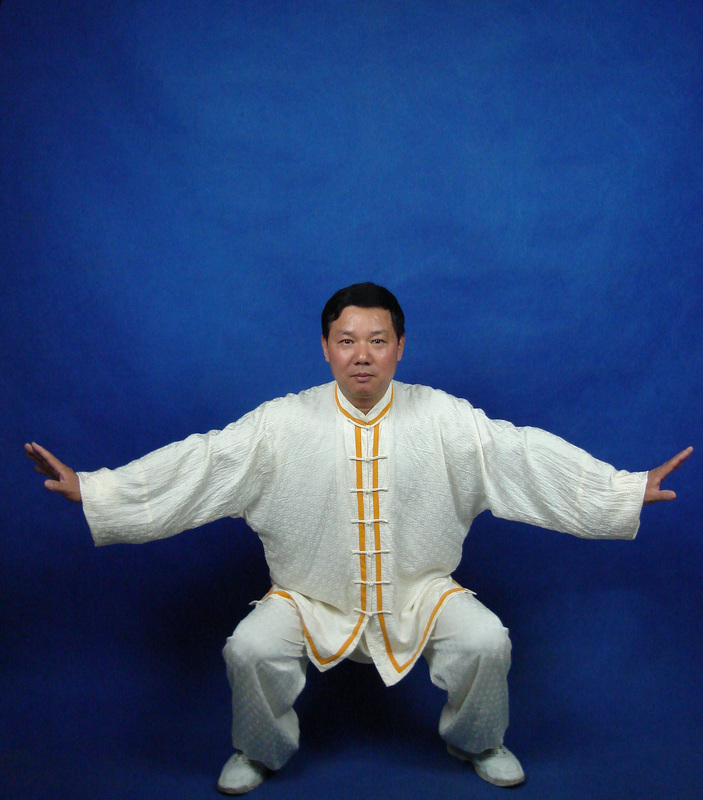 When lowering downward, the toes of the feet grab the earth, the YONG QUAN acupuncture points raise upward, the body above and below is linked as one, the joints are connected together, gradually, slowly and evenly, press the BREATH down to the earth. 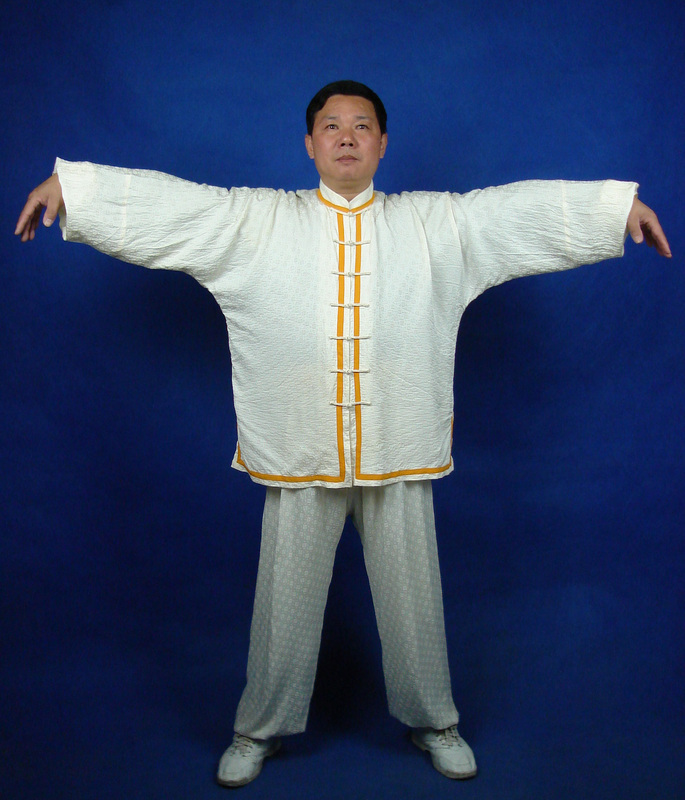 The shoulders relax and the BREATH travels down to reach the elbows, the elbows sink down and the BREATH travels down to reach the wrist joints, the wrists sit then the BREATH penetrates the fingertips. 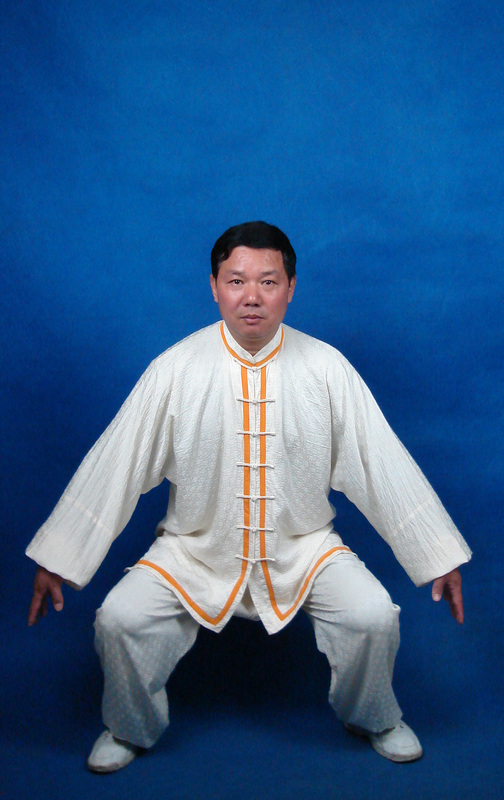 The hips relax and the BREATH travels down to reach the knees, the knees are restrained and the BREATH travels down sinking to the YONG QUAN. When circulating the breath, concentrated attention and total consideration are required, try to achieve: agile, relaxed, well-distributed, long, and penetrating. Agile, respiration is agile and delicate; relaxed, the breath is drawn in and issued out gradually and slowly; well-distributed, the time of breathing out and breathing in is even and gentle; long, the duration of the separation between breathing in and breathing out must be longer; penetrating, the breath must permeate and enter the four limbs and hundred bones, connecting the whole body. Each time, practice 6 times or 9 times to make one set. Practicing again and again in succession is fine. The size of the movements, large or small, high or low is not restricted, but depends on the age or youth, the extent of physical strength, and the strength or weakness of the physique of the one who is practicing. These lessons are for our students. If you have already registered, please log in. If you would like to enroll in this course, you can register here. 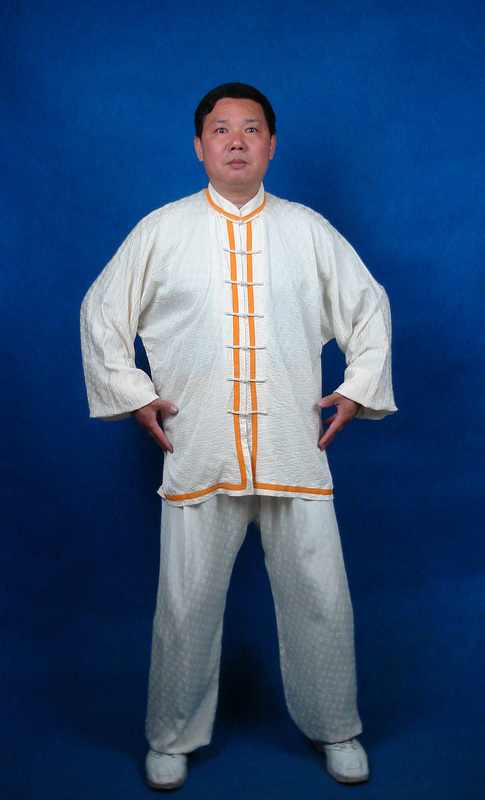 The Wudang Research Association promotes the study of the philosophy and practice of traditional Wudang martial arts. 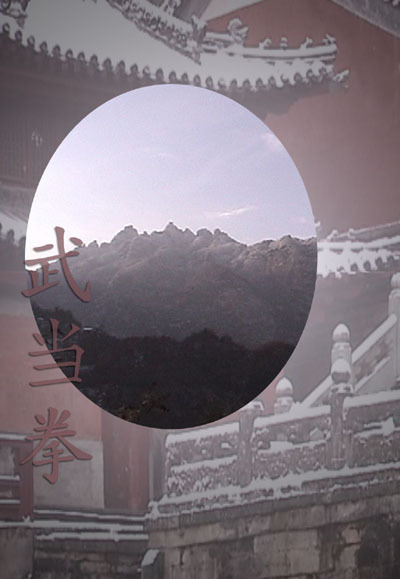 Since 1996, we have welcomed visitors from 160 countries to our site, in English and Chinese.